Brothers Dodie Boy Jr and Dave Peñalosa continue their march to boxing fame when they face Thai opponents in the undercard of the championship fight between Filipino-American Brian Viloria who will defend his flyweight boxing title against Mexican Juan Estrada in Macau on April 6. The Peñalosa brothers are both undefeated in their young professional careers. The elder Dodie Jr is undefeated in 10 professional fights, winning all of them by knockout. His latest victory was a devastating knockout win over American Jesus Lule in the undercard of the Pacquiao-Marquez IV last December. 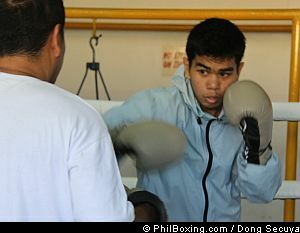 He will face Thai Ngaotawan Sithsaithong who has a record of 10 wins, 9 losses and a draw. Dodie Jr packs power in both hands as proven by his record. He has yet to face a quality opponent although his last 3 fights were against foreigners. Dave, on the other hand is also undefeated in 5 professional bouts. He won of his 3 of his fights via stoppage. Dave is the more finesse boxer among the two promising fighters. He last fought against Yodpichai Sithsaithong of Thailand whom he KO'd in 5 rounds. He will face another Thai boxer, Cheroenchai Sithsaithong, who is coming off 4 consecutive wins after dropping his first three professional fights. The brothers are sons of former International Boxing Federation light flyweight and flyweight boxing champion Dodie Boy Peñalosa who now serves as their trainer and chief corner man. Their grandfather Carl Peñalosa was also once a highly rated Philippine light welterweight campaigner. The two are also nephews of recently retired world boxing champion Gerry Peñalosa. Gerry won world boxing titles in the super flyweight and bantamweight classes. He failed in his 3 attempts to annex a third division world title, the super bantamweight crown. Gerry is now a promoter and is managing the boxing careers of his nephews. The former boxing champion hopes his nephews will make good account of themselves. He earlier said Dodie Jr could get a crack at a world title in two years’ time. Right now, he added, both Dodie Jr and Dave should continue to build their confidence and skills if they hope to be world champions in the future. Photo: Dodie Boy Penalosa Jr (R) doing the mitts with his father/trainer former world champion Dodie Boy Penalosa.